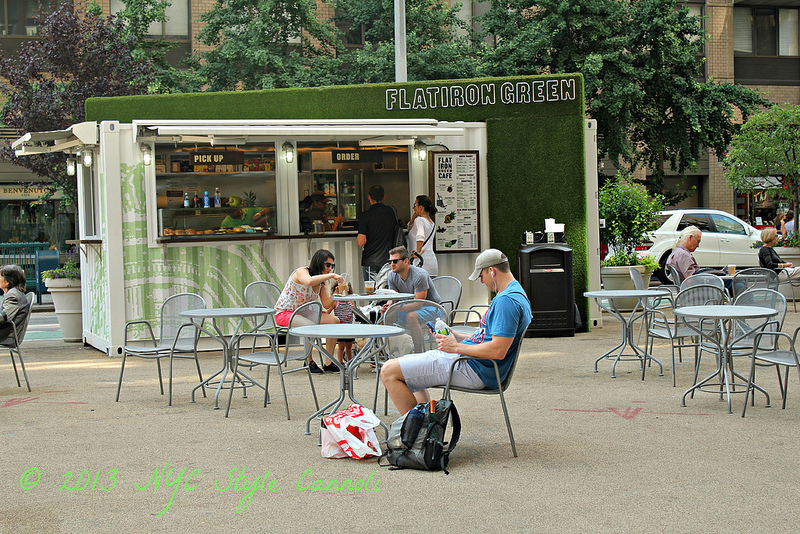 Photo Gallery Thursday "The Flatiron Green Cafe"
The menu offers a wide variety of natural, local and organic foods including baked goods, smoothies, hot drinks and an assortment of delicious and creative Greek yogurt combinations. The innovative menu is unique in the Flat Iron District and was developed with an eye toward healthy, delicious, quick and affordable fare. But more than delicious food, Flat Iron Green was built with an eye toward the needs of the community and the environment. Where ever possible, natural and organic foods are used. The café itself used a re-purposed shipping container for the structure and reclaimed lumber for the counters. Even our menus are special: they are made of seed paper. Cover them with with soil and water to watch wild flowers grow! Before opening Flatiron Green Café, the Mallas family has served scrumptious food and salads at the corner of 23rd and Broadway at Benvenuto Café for more than fifteen years, giving them deep roots in the community. This is so awesome! How eco-friendly are they!?! They've truly thought of everything. I love the whole concept. very nice. Yes they did I am sure it will do quite well.